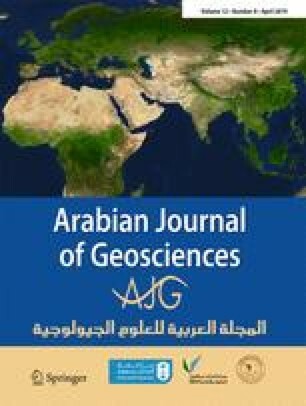 The assessment of water quality of the Dagwan stream encompassing spatiotemporal variations in physicochemical parameters and all important and relevant hydrological attributes was carried out at five different sites for a period of 1 year (June 2014–May 2015). Statistical techniques like analysis of variance (ANOVA), cluster analysis, and regression analysis applied to datasets revealed spatiotemporal variations. ANOVA and Tukey’s box plot was applied and resulting F values showed the significance of observed variation of each parameter at 5% level of significance in which some parameters do not change significantly. The higher positive and negative relationship among various analyzed water quality parameters were described by general linear regression model (P < 0.0001). The study of physicochemical parameters signify that the quality of its water substantially declines while moving downstream. The water quality sites were classified into significant clusters (clusters I and II) by cluster analysis. Cluster I (sites I and II) is illustrated by similar and better water quality whereas cluster II (sites II, IV, and V) is considered to be of moderately reduced water quality, thereby reflecting the different physicochemical characteristics and quality class. The results from water quality index (WQI) validate that water of the Dagwan stream falls within the excellent to very good category of water quality class. While comparing the results with WHO standards, the water quality was in permissible limits. The escalating level of pollution from upstream to downstream sites indicated slight anthropogenic stress in the downstream areas of the Dagwan stream. We are highly thankful to the head of the Department of Environmental Sciences, University of Kashmir, for providing all the lab facilities. Thanks are also due to the Wildlife department and Dachigam National Park officials for facilitating the research work in the field. The authors acknowledge the role of Dr. Sajad Hussain Wani, Assistant Professor, Department of Linguistics, for going through the article which enhanced the language quality of this research article. Thanks are also due to two anonymous reviewers whose inputs helped in improvement of quality of the manuscript.